Here’s the grabber up front. 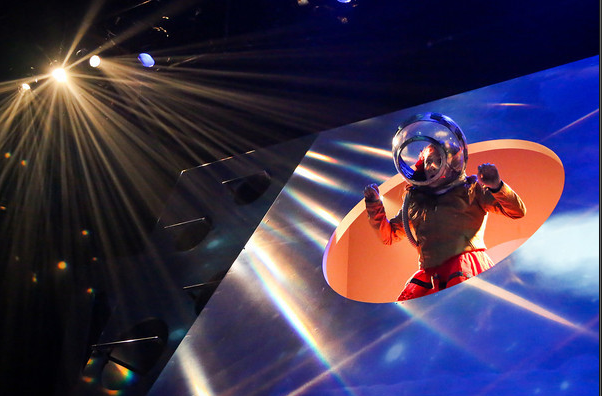 Synetic Theater’s A Trip to the Moon is one of the most exciting, imaginative, flawless pieces of theatre I’ve seen in light years. If I were to use a rating system, I would give it five glowing stars. 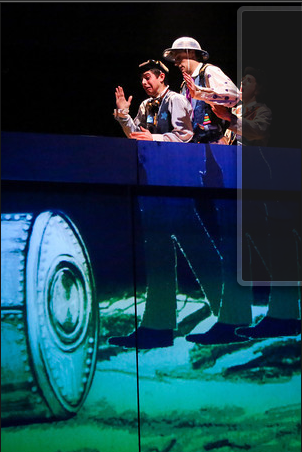 Pasquale Guiducci, Ben Arden, and Victoria Bertocci in “A Trip to the Moon.” Projection Design by Jared Mezzocchi. Photo by Johnny Shryock. In this wonder-filled production Japanese director/writer/illustrator and Georgetown professor, Natsu Onoda Powers brings us a lively triptych of vignettes. In the first she sources her inspiration from George Melies 1902 silent sci-fi film, Le Voyage Dans La Lune referenced in Martin Scorsese’s recent Oscar-winning film Hugo. A stage-wide interactive paper scrim delivers illustrations, schematics and film projections dovetailing with the action on stage. Performers seamlessly slide in and out of invisible openings in the paper and there is a heightened experience achieved by integrating an alternate stage above the main stage. By incorporating that usually empty third into the design, there is full use of the space for performers to deliver their performances both from above and below. In one hyperkinetic scene the astronauts, working with a collection of cutout shapes cleverly reconfigure the pieces to depict boats, airplanes and a hot air balloon to create a design for their spacecraft. The action becomes more and more frenetic including prancing chorus girls and mad scientists whirling about. It’s an hilarious moment when the man in the moon walks on stage, wrapped in shiny black plastic with a white circle of paper surrounding his face, and is slathered with ‘moon whip’. With Synetic there is always that connection to the Theatre of the Absurd. 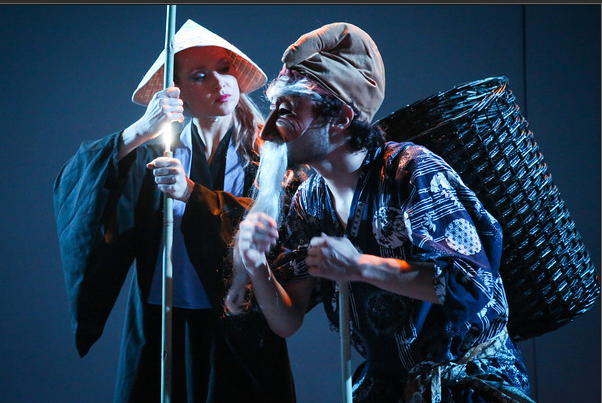 Francesca Jandasek and Colin Analco in “A Tale of the Bamboo Cutter.” Photo by Johnny Shryock. The second in this series of space travels is The Bamboo Cutter, an ancient Japanese tale of a woodsman (played by Colin Analco) who finds a child in a glowing length of bamboo. He takes her home to his wife and she becomes a beautiful princess with magical powers. Katrina Clark deftly plays the gossamer moon maiden. To please her father she must marry but first she orders suitors to pass a rigorous test – to find a silver branch with gold pearls from a treacherous island, a necklace from a dragon and a golden egg. The young men attempt to woo her with Kendo fighting, song, juggling, pantomime and modern day sign spinning. There is even a Chippendales-style dancer and a hip-shaking hula hooper bent on winning her affections. In this piece the costumes by designer Kendra Rai are both fabulous and phantasmagoric with heavily beaded and trimmed robes, gowns and fanciful headpieces. Sets designed by Giorgos Tsappas, seem lifted from classical 17th Century Japanese paintings. The final story is set in Moscow in the 1950’s. It is the story of Laika, the first dog to travel to the moon, and is told from the dog’s perspective. Endearingly and unforgettably performed by Karen O’Connell, who is costumed as the other canines in furry muscular leggings, it is a tale of a little stray who finds her dog family in the mean streets, is then captured and taken to a dismal pound only to be saved by rocketeers for a space mission. It is told through woofing, yipping, baying and whimpering and through the eyes of the adorable Laika. If you’re a dog owner, or have ever known a dog, you will howl with pleasure, especially in the indelibly romantic dream sequence of a pas de deux between Laika’s adoptive mother (Francesca Jandasek) and the Moon King (Ben Arden). Through January 6th at Synetic Theater, 1800 South Bell Street, Arlington in Crystal City. For tickets and information call 1 800 494-8497 or visit www.synetictheater.org.